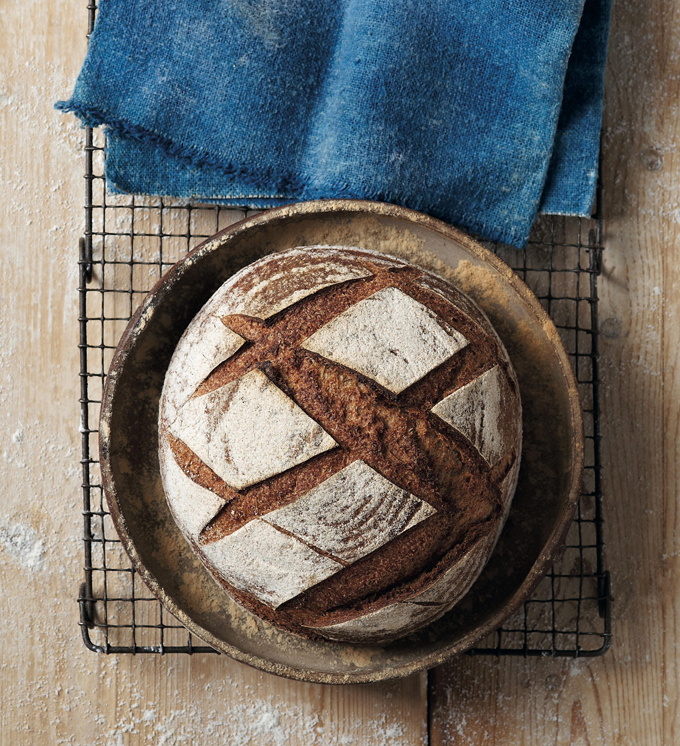 This is Emmanuel Hadjiandreou’s Wholemeal sourdough recipe – I first met Emmanuel about six or seven years ago. I was recording a a programme for the BBC Kitchen Garden Show about croissants. What I remember most was how magical its was to pass on his knowledge, and how his international background has influenced his baking. Em has a unique insight, learning his craft in a German bakery and had worked for both chef Gordon Ramsay and Daylesford Organic (an award-winning organic farm shop in Oxfordshire, England.) His work has, over the years won him many awards, such as the Soil Association Organic Food Award for his sourdough. His previous book, the best-selling How to Make Bread, has also earned Emmanuel the prestigious Jeremy Round Award for Best First Book at the Guild of Food Writers Awards 2012 – and has now been translated into13 languages including a Japanese version I saw recently. I asked to Em sign a copy of his new book, as a giveaway, which I have here .. so simply comment below and retweet this article or post to Facebook or Instagram and comment with the #SourdoughClub hash tag ( Please cc us in @Sourdoughclub or @VanessaKimbell) We will pick a winner on the 27th of August at random and post this to you. In the meantime this is the simple wholemeal/wholewheat loaf , which is the one on the front cover, and one that Em says is a is a good one to start with. All it takes to make it look really attractive is a couple of slashes after the proofing stage. Bear in mind that different brands of wholemeal/wholewheat flour will require different amounts of water when making this loaf. In a small mixing bowl, mix the flour and salt together thoroughly. Set aside. This is the dry mixture. Add the sourdough starter to a large mixing bowl. Add ¾ of the water and dissolve or break up the sourdough with your hands. Add the dry mixture. Stir the mixture slowly with your hands until it comes together and there are no dry bits at the bottom of the bowl. Add the remaining water. If the mixture doesn’t come together and it seems a bit dry, add more water and record how much you used for next time. The dough should be slightly sticky. Cover the mixture with the small mixing bowl that contained the flour mixture. Leave to stand for 10 minutes. Knead the mixture 10 times. Turn the ball of dough over in the bowl and make a finger mark in the dough (to indicate the first knead). Cover with the small mixing bowl again and leave the dough to rest for 10 minutes. Repeat steps 6–8 another 3 times, making sure the mixture is covered between kneads and remembering to mark the dough indicating the amount of kneads done. Cover the dough and leave it to rise overnight in a cool place (not in the fridge, though). The next day, gently punch down to de-gas the dough. Remove from the bowl, using a light sprinkling of flour so the dough does not stick. Shape the dough into a ball. Coat the proofing/dough-rising basket with flour. Coat the top of the dough with flour and place seam-up into the basket. Allow to proof for 2–6 hours or until the dough has nearly doubled in volume. Cover with a shower cap or with an upturned mixing bowl if a skin starts to form. Place the dough in the fridge for 30 minutes to stabilize it. Preheat the oven to 250°C (500°F) Gas 9. Place a deep roasting tray at the bottom of the oven and a baking sheet on the middle shelf. Turn the dough out onto a floured peel. Slash the loaf with a sharp serrated knife or a lamé with a design of your own choice. Slide the loaf onto the preheated baking sheet in the oven. Pour a cup of water into the hot roasting tray and lower the temperature to 220°C (425°F) Gas 7. Bake for 30–40 minutes until golden brown. Tap the loaf on the bottom. If you hear a hollow sound, it is ready. If you are not sure, return it to the oven for a further 10 minutes. Remove the loaf from the baking sheet and allow it to cool on a wire rack. This recipe published with kind permission of Rylands Peters Small Publishers – I highly recommend getting a copy. 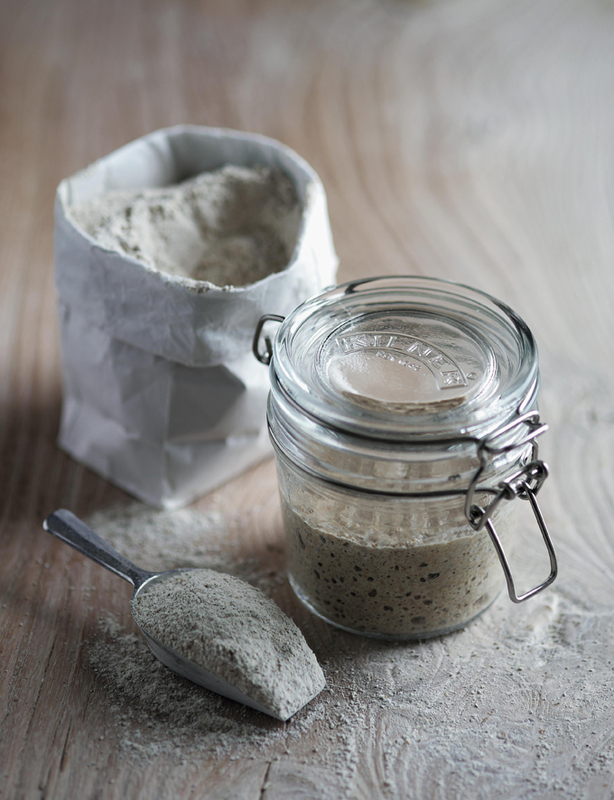 – How to make Sourdough. Share the post "Wholemeal Sourdough Recipe"
Can’t wait to try this recipe and see how it works here in the UK. Most of my baking has been done in hot climes and I am almost relearning how to proof and bake over here. Slowly but surely getting there. Wholemeal is definately my favourite loaf but can often be challenging. Will certainly try this recipe. The book sounds like it has lots of great recipes too. Such simplicity and a thing of great beauty. Joy. I am really looking forward to trying this out. The book sounds like a must read. ? It’s great that even with your experience and expertise you still feel inspired by others. It’s a funny thing to specialise in a subject. Everyone assumes that you know absolutely everything, but actually the more I learn the more there is to know. I am constantly inspired by amazing bakers, making sourdough, both home bakers and commercial bakeries, and actually feel very privileged to be able to share knowledge, but thank you for such a kind comment. This recipe looks great and I really want to try it out. However how come so little starter is needed? 25g seems a lot less than the usual 300g I mix in my usual loaf… Thanks in advance for your wisdom! Longer ferments need less leaven. Too much and it will over prove, especially wholemeal flour, which is packed with nutrients that get things going quite quickly. Hey Elvira.. so good to here form you. Didn’t we have a fab time in Hoor and Copenhagen?! Why do people bang on about these complicated (and ridiculously time-consuming) methods for making sourdough bread? I have developed a fantastic recipe that requires virtually no kneading and hardly any effort! It’s this: you put all the ingredients: 9g salt, 600g wholemeal flour, 30g oil, 430ml water and about 400 grams of starter (this is just 400g of dough kept back from the last loaf), in a Panasonic or similar bread machine set to the French stick dough only program. You just lob it all in and press go! That’s it! At the end of the program or even an hour or so before if you wish you take it out & give it a very quick knead – no more than 30 seconds – just to get it into a manageable/handleable lump. Cut off your 400 grams to use as a starter for the next loaf and put in a covered bowl in the fridge for your next loaf. Then put the remainder of the dough in a greased bread tin and then into a proofing cabinet (set to 21 – 27 degC) for about 3 to 5 hours depending on temp setting on proofer (Brod & Taylor do one). Then cook it for 30 minutes at 190 degrees in a fan oven or 200 degrees in a normal oven. That’s it! So easy – and it produces a fantastic loaf that’s very light and uniform and a shape that’s easy to cut into proper slices – none of this round hard to cut boule nonsense!. All this banging on about banetons and in and out of the fridge and this twiddle and that twiddle is a load of twaddle and frankly just drives me nuts! IMHO it’s just to make people seem clever by dint of mystification! Thanks for the recipe Vanessa – it is really fun to have made bread with yeast harvested from “thin air”. And Philip I appreciated your simplification which I have used successfully, except that I just used a dough-hook in place of the “bread machine” stage. Sounds great, but I’m confused by this bit, where it says to “knead it 10 times” and then goes on to say you have to knead it three times. What does the initial “knead 10 times” mean, please? “Knead the mixture 10 times. This is really interesting as it seems pretty much the opposite from your method Vanessa. Salt in with flour straight from the start, and knocking back the dough to degas. I thought it was all about preserving the gas that had formed,to keep the dough airy and light. I tried making this loaf today (first sourdough actually) and I don’t think I floured the banneton enough. When I turned the dough out on to the baking sheet it just degassed and flattened. You have over proved it by the sounds of things. Now I’m getting better results with my white sourdough I thought I’d try this wholemeal recipe again, but it was as disastrous as last time. I posted a few months ago to ask what “knead 10 times” means but am still none the wiser. I gave the dough a good knead initially and tried repeated stretching as I do for white sourdough. For white sourdough, the dough gets stretchier each time and more elastic, but with the wholemeal it started off quite elastic after the knead, but each subsequent stretch it seemed to be less elastic and more prone to tearing. Anyone successfully tried this recipe and any ideas where I’m going wrong? I have seen Emmanuel’s method live on a two day course: the premise is to keep the dough within the bowl at all times (less mess plus the sides of the bowl act as pressure on the ball of dough), do not turn out onto a tabletop to knead. Pick up a corner of the dough, pull into the centre and press down towards the side of the bowl using a fair bit of pressure = knead one. Turn the bowl a little, pick up a corner of the dough bringing toward the centre again and push down = knead two. And so on, ten times revolving the bowl at each knead. Cover with a shower cap or an upturned bowl, leave 10 minutes and repeat the process until the dough has been ‘processed’ within the bowl, pulling/pushing against the bowl sides and turning each knead, four times. His sourdough book has very clear step by step pictures and I use it pretty often for recipes. This was my second attempt to make a sourdough load using my own basic starter. Though I used a circular backing tray which was too small, the taste is incredible. The dog has never begged with such enthusiasm before. I’ve made this sourdough according to the recipe several times now and it’s made a lovely sour tasting crusty bread. Problems I’ve had have been not cleaning the bowl before proving the second time so it all stuck and came out in 2 pieces! Still tasty though. Then another time I couldn’t do it all according to the timings suggested, so half way through the first prove I put it in the fridge for a couple of days and then took it out when I had the time to finish it, again, this worked fine and produced a delicious loaf. Thanks Vanessa!